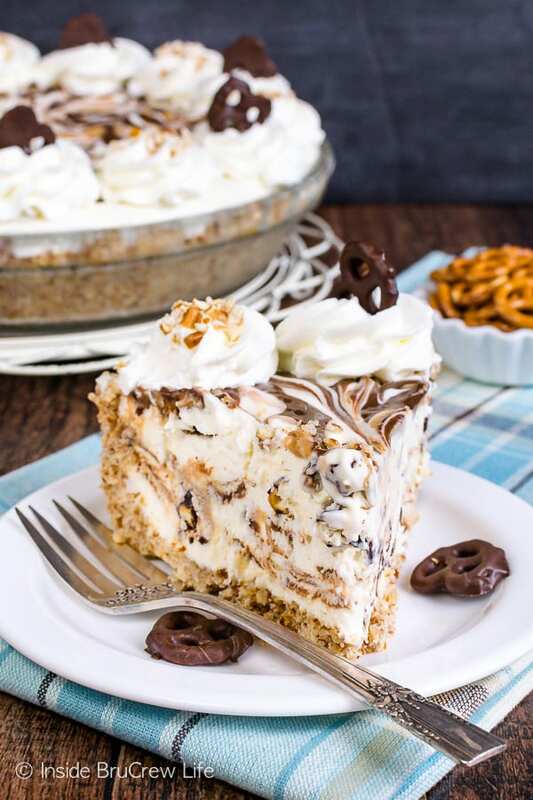 Peanut butter swirls and chocolate covered pretzels add a fun flair to this Chubby Hubby Ice Cream Pie. 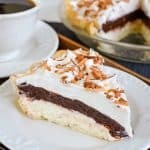 This easy dessert is the perfect summer dessert! Did you know the month of July is National Ice Cream Month? That’s right. An entire month dedicated to the chilly creamy dessert. Pretty cool, huh? And yesterday (July 15) was also National Ice Cream Day. I sure hope your month (and yesterday) has included some sort of ice cream goodness so far. 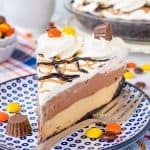 I splurged on a sliver of ice cream cake for a friend’s birthday a few days ago, and now all I can think about is making another Reese’s Ice Cream Cake. 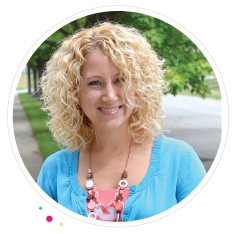 Want to know a huge secret? Growing up as a kid, I didn’t like ice cream. I know, right? What kid doesn’t like ice cream? I think it was that I didn’t like how cold ice cream was. But I always ate pudding pops when we were at my grandpa’s house. Looking back now, that makes no sense to me. Both treats are cold, so why was I ok with one and not the other? Good thing I grew out of that strange phase. 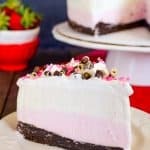 I’m all about a bowl of ice cream or a slice of Neapolitan Brownie Ice Cream Cake these days. Well, those days have gotten a little bit farther apart. I kind of like that my skinny jeans fit pretty good right now. Since I prefer to keep it that way, I have been keeping the sweets to just a bite or two each week. BUT. 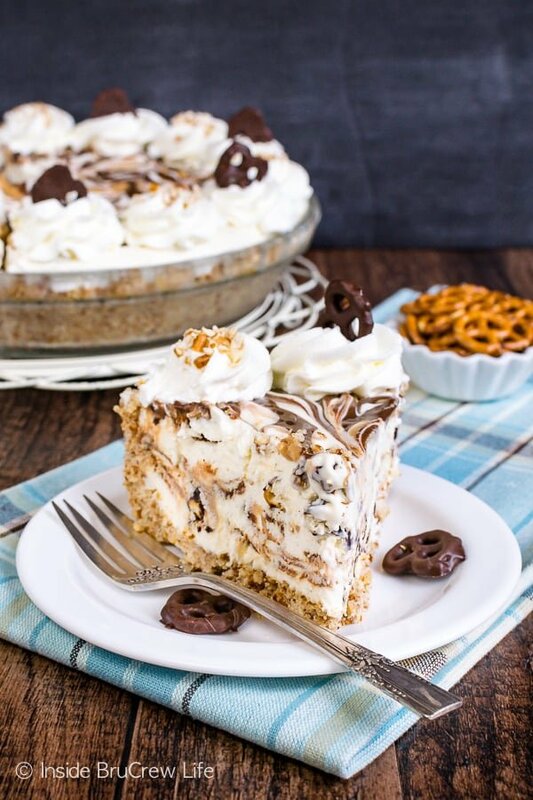 Then I got this crazy ice cream pie idea in my head, and I just had to make it right away. 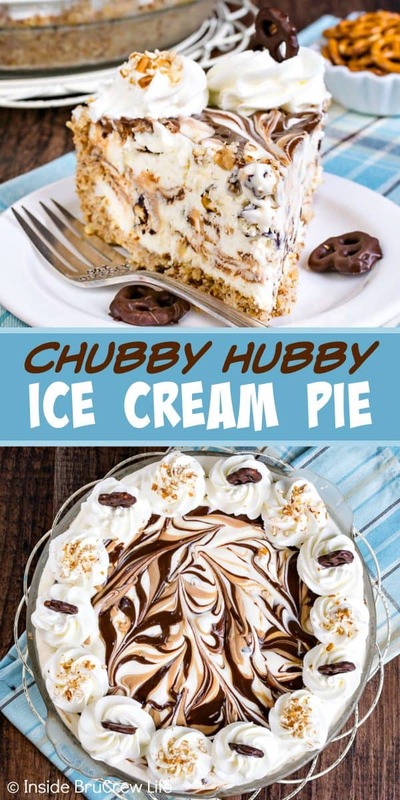 Raise your hand if you have ever had the Ben and Jerry’s Chubby Hubby ice cream? I have actually never had it, and I guess I will never get the chance to try it because they don’t make it anymore. That’s ok though because I came up with a delicious homemade alternative for you. Crush your pretzels into tiny pieces. A food processor works great, but if you don’t have one go ahead and put the pretzels in a plastic bag and go to town smashing them. 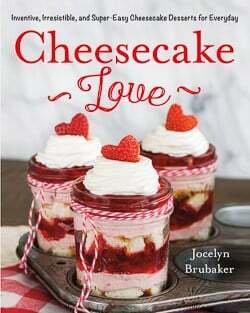 Mix the butter, sugar, and pretzel crumbs together and press into a 9 1/2 inch deep dish pie plate. 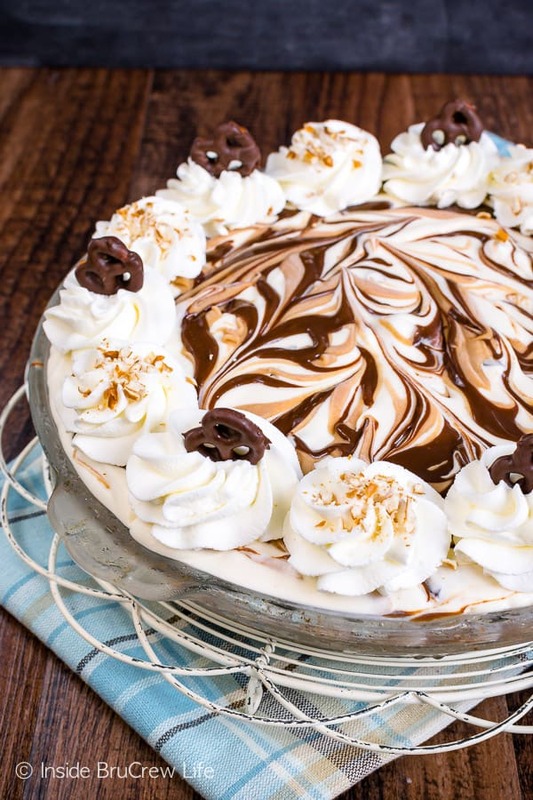 It needs to be a deep dish because you need the room for all the ice cream. If you don’t have a round pie plate, you could use a 9 or 10 inch round springform pan. Beat the whipping cream and malt powder until soft peaks form. 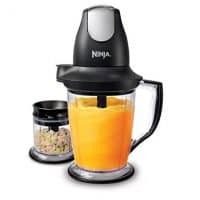 Chill your bowl and whisk attachment ahead of time to make it whip up faster. Beat the cream cheese until nice and creamy. Slowly add the sweetened condensed milk and whip that until it is very creamy. Fold the homemade whipped cream into it. Stir the chocolate covered pretzel pieces into the mixture. Spoon half the mixture into the crust. Top with peanut butter and hot fudge and swirl it gently. Repeat with the remaining ice cream and toppings. *You will have just a little bit of the ice cream mixture leftover if you are using a pie plate. 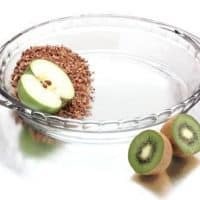 Put it into a separate container and put it in the freezer for an extra treat later. 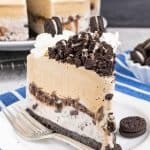 Freeze the ice cream pie for at least 6 hours or overnight. Right before serving add whipped cream swirls and chocolate covered pretzels. If plain ice cream is more your thing, skip the crust and freeze the mixture in a large freezer bowl. 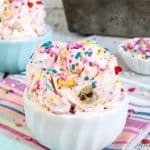 A crunchy cookie crust and two layers of ice cream make this Chocolate Chip Cookie Dough Ice Cream a delicious and impressive summer dessert. The swirls of chocolate brownie goodness in this Brownie Batter Coffee Ice Cream will have you wanting another scoop in a hurry. A scoop of this Peanut Butter Banana Ice Cream is a healthier option when you are craving a sweet frozen treat. 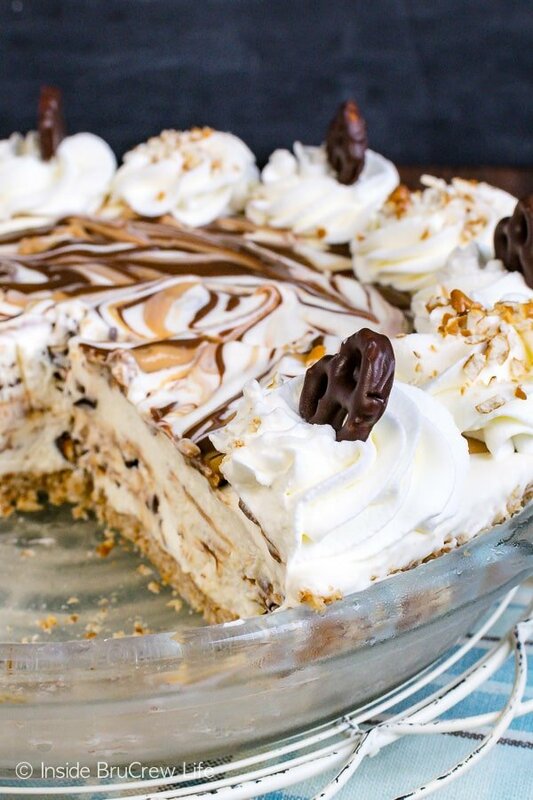 This Homemade Dairy Queen Ice Cream Cake from Brown Eyed Baker looks just like the real thing. Perfect dessert for every birthday. 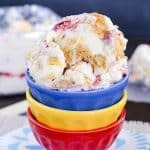 A container of this Fluffy Strawberry Banana Ice Cream is a great way to use up fresh fruit. Plus who can resist a pretty pink homemade ice cream? Crush the pretzels in a food processor. You can also use a plastic bag and a wooden spoon to crush them. Beat the malt powder and whipping cream until soft peaks form. Place in the refrigerator for a few minutes. Beat the cream cheese until nice and creamy. Slowly add the sweetened condensed milk and beat the mixture until creamy. 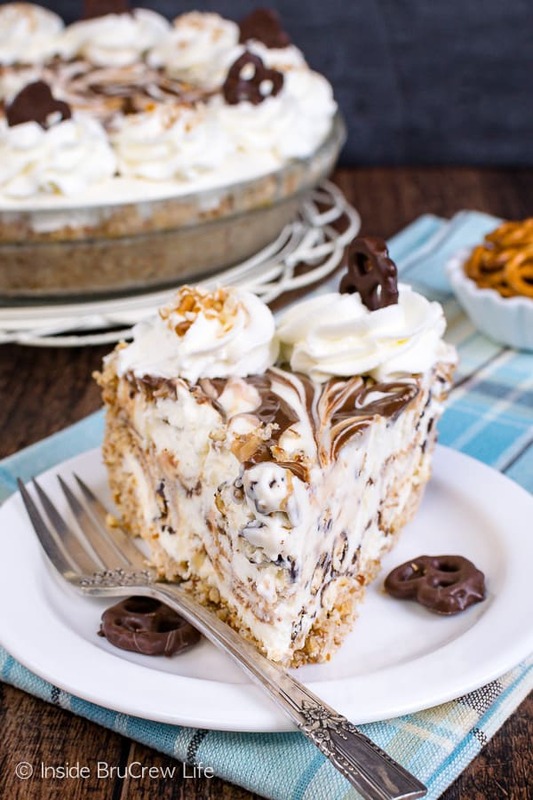 Fold in the whipped cream and chocolate covered pretzel pieces. Place the hot fudge and peanut butter into two microwave safe bowls. Heat for 15 seconds. Stir until creamy. Spoon half the ice cream mixture into the prepared crust. Drop half of the hot fudge and peanut butter on top of the ice cream. 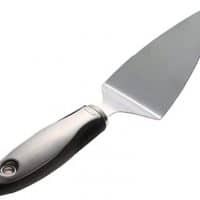 Swirl gently with a knife. Spoon the remaining ice cream on top gently until it reaches the top of the crust. You will have a little bit of ice cream leftover, so put it in a separate container and freeze it. Add the remaining hot fudge and peanut butter and swirl. Freeze for 6 hours or overnight. Beat the remaining whipping cream and powdered sugar until stiff peaks form. 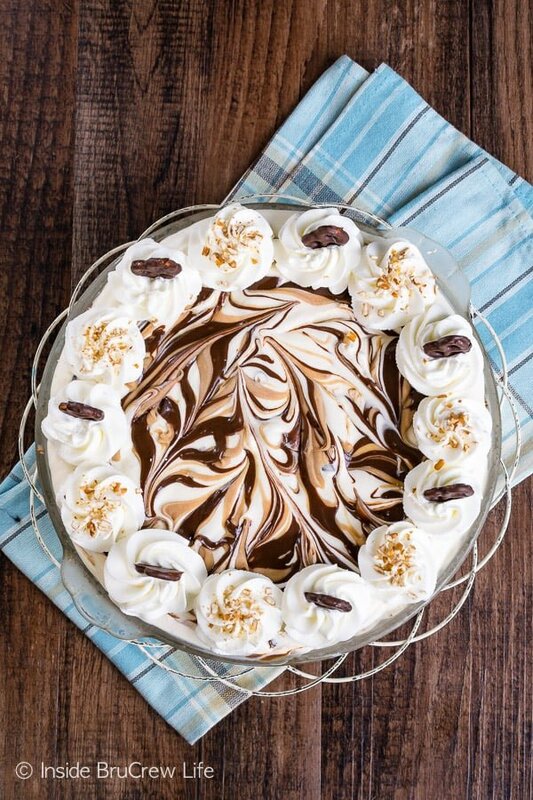 Use a piping bag and icing tip 1M and swirl the whipped cream around the edges of the pie. Top with extra chocolate covered pretzels. *You could also use a 9 or 10 inch round springform pan. *This post contains affiliate links. Inside BruCrew Life may receive a small percentage from purchases made through these links. As always, these free links do not cost you any extra. Thank you for letting us share our favorite products with you this way. It looks delicious. Just wondering what original malted powder is and where you buy it. It is the vanilla malt powder that you can add to drinks. Most grocery stores sell it in the hot chocolate/coffee aisle. They also have a chocolate version of malt powder.